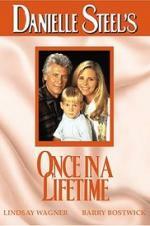 Buy or Rent Once in a Lifetime (1994) Movie DVD & BluRay Online! Movie Plot: Millions adored Daphne Fields, for she shared their passion, their pain, their joy, and their sorrow. America’s most popular novelist remained a closed book. She hides many secrets. The husband and daughter she lost in a fire. The son who barely survived it and would be deaf forever. The victories, the defeats, the challenges of facing life as a woman alone and helping her son meet the challenges of his handicap. A strong woman, she would not accept defeat, or help from anyone- until she found she could no longer face it alone.